Curious about what all the hype is about when it comes to the Midwest African American Genealogy Institute? Beyond the tracks and workshops lies an amazing resource to help you grow your family history project. After 5 years, the Midwest African American Genealogy Institute (MAAGI) is still going strong. July 2017 marked the second time the Institute took place at the Genealogy Center at the Allen County Public Library in Fort Wayne, IN. 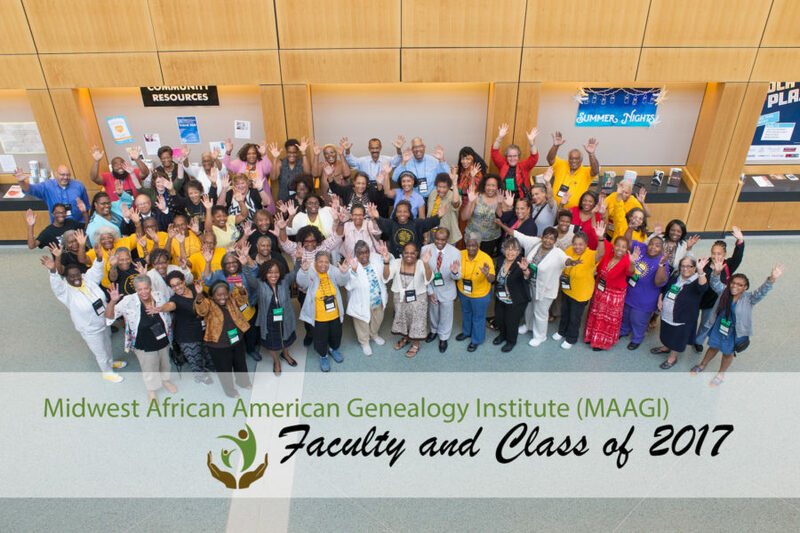 MAAGI is not like your traditional genealogy conference in that it is structured in a workshop format with most sessions giving assignments or projects that you complete while you’re at the event that are tailored to your specific research goals. As with last year, I taught in track 2 and 4 and took official photos. Track 2 was so popular that it was sold out months before the Institute took place. We also had the largest group we’ve ever had with 50+ people in attendance. Did You Miss My Facebook Live Streams? Each stream focused on what makes MAAGI unique, allowed the public to see what the event was all about, and also provided viewers with feedback directly from the students who attended. We broadcasted an episode of BlackProGen LIVE during the Institute. Episode 38 featured MAAGI alumni Yvette Porter-Moore, Linda Buggs-Simms, and Willie Russell, IV along with new alumni April Branch. We touched on the experience of the alumni (Yvette and Linda have been to every MAAGI since it began), answered viewer questions live, and tackled another Ask Mariah case. Lastly, I put together a short video and photo slideshow, from my perspective, of what it’s like to attend as a student and as faculty. 2018 is poised to be just as successful as 2017. The tracks will remain the same, but I’ll let you know now that Track 2: DNA & Genealogy is already halfway full, so be sure to get your deposit in ASAP if you’re interested in that. It’s the only DNA course available with a specific focus on African American genealogy that is in a workshop format, so spots are going FAST! Kudos to the coordinators for their diligence and hard work, to the faculty for their expertise, and the students/alumni for their willingness to learn and grow in their genealogical pursuits!